Looking for other ways to connect with Colts fan from around the world? Or maybe you are wanting to discuss in more detail colts articles and news? There are a few options to achieve just that. The Indianapolis Colts have released an all new Fan Forum for the 2011 season. The forum has many of the great features you would look for in a forum, as well as a great community of active fans who share your passion for the game of football and the Indianapolis Colts. Pierre Garcon – Punt Returner? Manning Says: If He Can, He Will. Absolutely. Colts Direct is the premiere online location to share a social experience with other Colts fans. Want to create your own custom Colts fan page, share your best Colts photos, or maybe located other local fans to connect with and tailgate? Colts Direct is the place for you. Be sure to stay tuned for other news and information regarding Colts.com, Colts Direct, and Colts Forums. 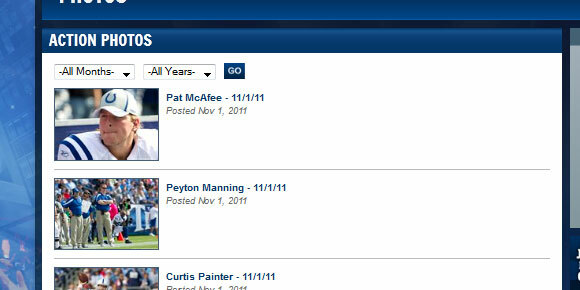 When you click on the players name…in this case Pat McAfee you will load Pat’s roster page. Along the bottom of that page is all of Pat’s recent photos and videos. If you wish to view all player photos instead of a specific player you can always browse by photo type. Under the Media Center Menu > Photos you can select a specific category of photo. If you select say “Action Photos” you will see a list out of action photos by most recent first. From anywhere on the site the search option is always available on the top right of the website. 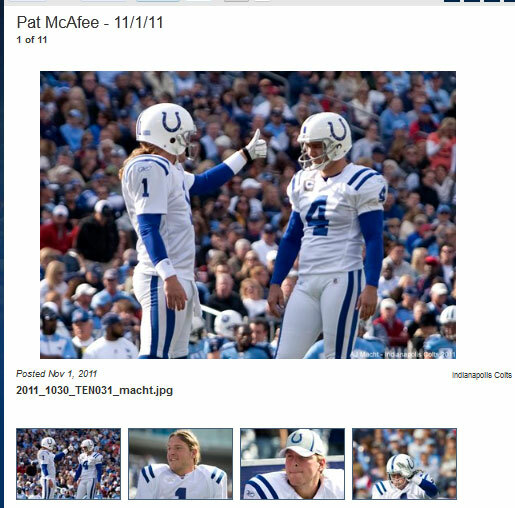 Enter your search term…in this case Pat McAfee and click the magnifier glass.